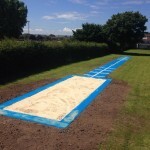 A number of schools and clubs in the UK are eligible for triple jump funding to install a range of different surfacing specifications for triple jump facilities. Financial help can be provided by sports surface funding organisations to help institutions who do not have adequate sports facilities and cannot afford to have their existing one improved or a brand new one built. These funding organisations are offering grants for projects which will help to promote healthy living to children and will bring local communities together. Having a brand new triple jump athletics track installed at your school will get the kids involved in a fun new sport and opening the facility up to the public will mean that the installation benefits the local community as well. If you’d like to get some more information about these grants, don’t hesitate to contact our team and let us know what you’re looking for. We’ll get back to you as soon as possible to offer advice on what is available. 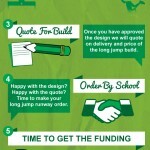 We understand that it can be difficult to find the budget or the time to consider having a new sports facility installed at your school so we can offer you all the triple jump funding help you need. Our services include assistance with your application for funding, as well as carrying out the installation of the new athletics facility once the funding has been granted. We are experienced sport surfacing contractors so we can help you design the perfect triple jump athletics facility to meet the requirements of your organisation and give you the athletics surfacing you need. Triple jump funding can be offered to organisations who successfully apply for a grant, this financial help will contribute towards the installation of a brand new triple jump athletics facility including a runway in either polymeric rubber or needlepunch synthetic turf, as well as a landing pit and any extra equipment which may be needed. It’s important to stress that while triple jump funding will be provided for the initial construction of the athletics facility, regular maintenance will need to be carried out to keep it in top condition. Therefore your organisation needs to be financially stable enough to maintain the triple jump runway and sand pit once it has been installed, otherwise your application for funding will not be successful. If you require any further information about funding for a sports facility installation, or if you’d like to enquire about another of our products or services, please fill in our contact form with your details. One of our team members will be able to offer you some helpful advice in regards to specifications, prices and quotes for your project.